Jeez Kev, you starting up a new dealership. This is going to be my new screensaver! I bought a new house today with a 845sqft 3 car garage and a 20x20 space in the basement for shop space. This is a big improvement over the 250sqft basement shop that I currently have! I bought a Hammer A3-41 with silent cutter head back in December and received it in March that I will finally be able to take out of storage. I will now need to purchase a tablesaw. I'm wishing that I went with a Felder over the Hammer so that I won't feel the need to upgrade a few years down the road. I also bought 2 axes and a Sloyd knife from Lie Nielsen. I also just bought a bike, but that's not shop related. I'm taking advantage of the Lincoln Sentry AWISA promotion that ends in a few days (for people in Oz). Sadly I have to wait a few weeks for their stock to turn up. I received multiple boxes with Incra table saw fence parts. @Holmz what happened to the plans for an Erika then?? Porter-Cable guide bushing MagnaLOCK ring. It's replacing an old (pre-2006) Jessum belt-driven lift that is sticking badly. I know Incra is made by Jessum, but no one is complaining about the new lifts sticking, so I'm hopeful. The clean sweep rings were part of the decision, as I'd like to improve the airflow from the top of the table to my under-table dust collection port. Getting acquainted to it in my friend's (and Snap-On Dealer) van. Orderd a few Robert Sorby chisels. Decided needed bigger stuff for hallowing so ordered sovereign chisels and Hope hollowing system with camera. Although I did really want Clarks hollowing system or Korby but both American so not easy to get. So settled with a less heavy duty british version. Hopefully it will come tomorow. 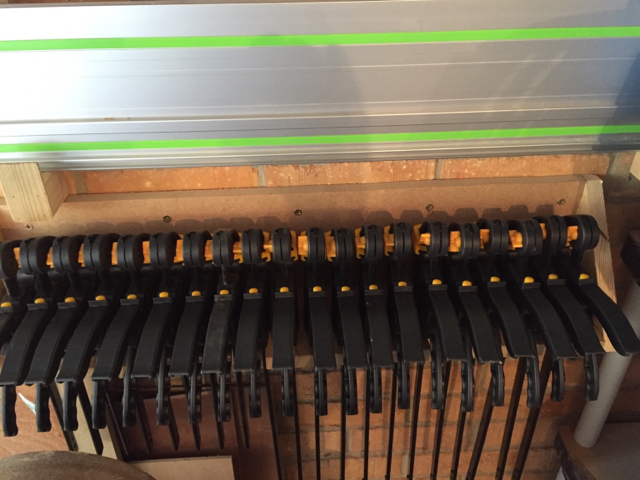 I bought a couple of Aldi cheap clamps and made a rack for them. They're not the best quality but very cheap and will be useful. £2.50 each is what they work out to be. Clamps are so expensive. Yet I have been stung couple times with cheap. But £2.50 is cheap enough to say it. Ironically it's the Invis system that's got me curious - and you don't need the Zeta to install them. My local has a promo on Bessey (that I don't think goes for much longer) .. you get 30% off if you buy a mixed 10 clamps. Just don't know what to grab. K-Blocks are great, but have quite a few already. Is that scary mask in the van the one your friend uses to rob banks to pay for his Snap-on addiction? So is yours the Secret Snap-on Order or The Knights of Snap-on ? Monitor and Camera arrived today. To add to the above, I took advantage of a Woodcraft sale to get the big boy PC router motor. Just couldn't resist. Added the 1/4" collet. A while back I routed my left index finger doing something that I knew better than to do. So I picked up a Woodpecker Free-Hand Guard as well. And a couple of silicon glue cups. Missing part from my last Snap-On order came in Friday. I think "Divario" must be Italian for "I forgot to install a shelf before I assembled it ..."
I think the planets must have aligned today!!! @Kev I am interested in what you do with the Invis, and also how the TruePosition jig works out. @Holmz the Invis is targeted at an interesting way of connecting fins to boards (think big old timber stuff). It'll be a while before I get to play with it, but it was available for a promo price .. can't pass that by. Today a pre-loved Woodpeckers 300mm Square arrived and a brand new Mini Square, fantastic. Very functional also outside the shop.